Bizzy Williams: Forget the law if illegal development makes money. Vaucluse Raceway was built without permission. The developers thumbed their noses at the law and did what they wanted to do. And, because we are a country where all laws are selectively applied and enforced for reasons of money, family, status and connections, the developers got away with it. No permissions, no permits, no plans submitted for approval, no environmental study, no traffic plan… and the only input from the community was HELL NO!!!. With support from powerful elites like Bizzy Williams, the government feared to close the place down. Some government officials tried to close it down, but the developers told them to Piss Off and kept working. Soon the government officials went away. A wise man would guess the government officials were given the word from high up. And maybe probably there were some “campaign donations” made too. Vaucluse developers ruined their neighbours’ property values and destroyed the quality of life for hundreds of folks living within the sound of the revving engines and squealing tires. Some folks can’t even get in and out of their gaps on race days. Vaucluse makes money and Bizzy Williams says that’s all that matters. He says the developers should be fined and then allowed to continue. After all, the place is making lots of money and the developers can afford to pay a fine, so fine them and let them continue, says Bizzy. The fine is a little concession so ordinary people can’t claim the law wasn’t respected. That is a disgusting manipulation but that’s Barbados. Bizzy even confessed that he didn’t follow the law when he took Bushy Park track so long ago. So, he says, the same should go for the Vaucluse developers. Bizzy and the Vaucluse boys show everybody that certain Bajans can do as they please – so long as Bizzy Williams or some other business or political elite supports the law-breaking. For ordinary Bajans, there’s nothing new in this story. We’ve heard similar happenings a hundred times. Remember the Turf Club collected $20 million in gate taxes but kept the money. You and I would be in jail for doing the same thing at our little shop. The government again proved there are two laws in Barbados… One law for THEM, and another law for the rest of us ordinary folk. Piss on the Law and pay a only small fine when caught, Mr. Williams? Ok Sir. I’ll follow your example from now on. Thanks. Why Al Barrack will never win against the Barbados Government: The Fix is In! “CONTRACTOR AL BARRACK HAS declared war on Government, saying Minister of Finance Chris Sinckler’s unfulfilled promises had convinced him it was not serious about paying him. 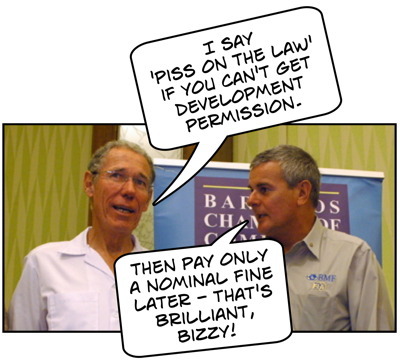 Barbados is broke and cannot, will not, pay a court-ordered judgement to building contractor Al Barrack. Mr. Barrack is ruined because there is no real rule of law ‘pon this rock. Successive Barbados governments ignore or obey the courts as convenient and right now it’s not convenient to pay Al Barrack the 70 million dollars as the court ordered. So Mr. Barrack is in back in the papers saying he has “declared war on the government.” Yes… THAT should teach the Barbados government a lesson! LOL! The real lesson here is that if you do business with or on Barbados, you’d better pray that everything goes well when it comes time to pay – because the courts don’t matter. It’s all about the cartels. Mr. Barrack thought he was favoured to get a huge government contract without an open bidding process, but it was all a set-up. Beware when you do business with the government of Barbados, because the court is the government and the government is the court. The Government of Barbados screwed building contractor Al Barrack $65 million dollars. That’s what the Barbados court ruled. Al built the new office complex at Warrens, but when previously unknown caves raised costs, the Barbados government didn’t live up to their side of the deal. That’s what the Barbados court found as it ruled against the Government of Barbados and determined that Barbados owed Al sixty-five big ones. That’s with an “M” for “million”. Poor Al is now reduced to writing letters to world leaders. As if they care and as if those leaders would side against an offshore banking centre like Barbados. A big chunk of the world leaders probably have funds flowing through Bridgetown ‘an their own countries don’t know. Try this little experiment on a nice day… drive to the Port St. Charles condo development and park at the north end by the old rotten fishing boats and then walk south on the rocks under the pier to the “exclusive” waterfront club until you find yourself on the PRIVATE beach in front of the condos. Erect a sunshade on the sand, sit down, take out something to eat and put on the radio. If you can get that done without securty coming to give you a rough time on the “private” beach, you will have done well. The last time some of our friends did that they were harrassed and photographed by the condo staff. How dare Bajans walk over the boulders that had been strategically placed to prevent people in bare feet from getting to the condo’s beach! With that in mind, we followed this little exchange on Barbados Free Press with great interest. Does anyone have more to add? March 11, 2009 at 4:19 pm Breaking news BFP. Tune in to Brass Tacks. Boulders placed on beach in st. Peter by Hotel. March 11, 2009 at 4:24 pm I am so angry that I will take a time out because I do not want BFP to ban me. Investigate BFP. I checked your “break-in news” about the boulders at Almond Beach. They even got two NCC rangers to tell the operators not to use that end, but the head of the Watersports Association took them on and they have had to reverse the decision. Chris Forbes told the watersports head that he could bring the police the NCC or the Prime Minister he was not moving the boulders. But the youngster turn on the heat and he was forced to back off. ARE WE TURNING BACK THE CLOCK? Too true, Don. Too true.